Despite the lowering of margins requirements on the part of the CME (Counterfeit Mercantile Exchange), metals took a bit of a tumble on Friday and tried and failed to rally yesterday. I’ve cautioned we might be hitting a short-term trading top. We know ‘seasonality’ studies call for a top in gold by the end of February while also calling for a very choppy period in silver until it reaches its theoretical May peak. A retracement in silver to 30-31 and gold to 1610-1660 would be ‘normal’. Anything beyond that, particularly on increasing volume would be a negative. That said, I remain on my BUY signal thinking we could still see gold at 2000+ this year. Silver could well test its high at 49-50. Stay tuned. Inverse Lin-omena, the inverse of the Jeremy Lin phenomena where the unknown and previously discounted suddenly rise to prominence; here, the powerful and previously secure suddenly fall. Today, central bankers, the mandarins of capitalism, are in disarray. Their attempts to contain capitalism’s current crisis increasingly resemble the tactics of a defeated army in retreat. Like Napoleon and Hitler’s respective “Moscow moments”, the 21st century economic crisis has brought to an end the bankers’ spectacular 300 year run at the table of power and wealth. The indebting of others as a means of accumulating wealth ends when the indebted can no longer pay what they owe. The arcane and esoteric scribblings of second generation University of Chicago trained economists cannot cover up this basic fact, i.e. that the indebted are broke; and soon, their creditors will be as well. The bankers’ franchise of credit and debt built on a leveraged foundation of paper money fractionally backed by gold allowed the West to accumulate geopolitical power and wealth on a vast scale. That era is now over. It ended when the gold convertibility of the US dollar was terminated in 1971 when the cost of maintaining a global military presence outstripped the ability of the US to pay in gold what it owed on paper. The resource markets have weathered some death defying ups and downs lately. But Michael Ballanger, senior investment advisor with Toronto-based Union Securities, is looking for a renewed period of growth in the TSX Venture Composite Index. Is it too soon to see such a heady rebound? In this exclusive interview with The Gold Report,Ballanger makes his case for history repeating itself. The Gold Report: The TSX Venture Composite Index reached a bottom of around 1,300 in October after it more than tripled from 2009 to early 2011. You believe the index is poised for another two-year gain. It’s an interesting theory. Why should we believe that history will more or less repeat itself so quickly? Michael Ballanger: It’s all about mathematics. However, underneath that forecast lurks a much deeper premise. I’m a member of a very small minority that believes we’re now in the continuation of a massive bull market in resources. The TSX Venture Exchange has had one sharp correction since 2008. It’s now resuming its uptrend. I’m also looking for a resurgence of the “manic phase” of markets. During the last manic phase in 1978–1981, the Vancouver Stock Exchange quadrupled in an 18-month period as gold went into its final ascendancy. TGR: What were some characteristics of the market in the ’70s that are comparable to what’s happening now? MB: Psychologically there are a lot of similarities to 1978 because investors have been behaving like scared rabbits. Fund managers were throwing things under the bus in October that I couldn’t believe. It was mass liquidation for no reason. It was a generational buying opportunity. TGR: There seems to be a lot more global instability now. Are you expecting “black swan” events in the next few years that could create further instability? MB: I’m not looking for Armageddon at all. I think we are going to have a really good two-year run. There will be bumps along the way as the world financial system irons out its issues. Nothing cures debt levels better than inflation and growth, however. TGR: This does seem to be a very friendly environment for commodity prices and resource companies. But aren’t we just one negative macroeconomic data point away from being right back where we were? MB: The problem with the media is that it continues to use European and North American data as its guidepost. Developing nations are creating demand for resources like I’ve never seen before. The population is growing and resources are being used at an increasing rate despite Europe, Japan and the U.S. struggling. A lot of these populations approach gold and silver differently than the West does. They’re not looking to trade it. It is part of their legacy that they pass down to generations. That’s where the demand for the precious metals will come from. It’s a shift in demand. TGR: Most of the junior mining companies listed on the TSX Venture Exchange are gold companies. If you believe the TSX Venture Index is going up, you have to believe the gold price will head higher, too. What’s your trading range for gold in 2012? MB: Industrial metals, like zinc, copper and nickel, are going to outperform the precious metals in 2012. Just as the base metals got hammered violently in ’08, the same occurred in the latter half of ’11. The resultant rebound should show a greater percentage move based on the global recovery. Silver could outperform gold in 2012 due largely to the supply-and-demand situation. However, gold and silver could both take out their 2011 highs this year. Gold at $1,525/ounce (oz) and silver at $25/oz will be seen as the correction lows in this multi-decade bull market. Those are two levels I wouldn’t want to see violated. TGR: What’s the upside for gold and silver prices? MB: Gold and silver could both take out their 2011 highs, but I don’t like picking numbers. It just gets meaningless. It is an absolute breeding ground for gold and silver bugs. Not that I’m one of them, but it is a very favorable environment for the metals. If you’re on the right side of the trend, you make money in the junior mining stocks. TGR: You created a 2012 list of your top value plays. Could you tell our readers about some of those names? MB: We emphasized Yukon stocks last spring and our two picks, Kaminak Gold Corp. (KAM:TSX.V) andATAC Resources Ltd. (ATC:TSX.V), hit record highs in July. The bright spot for this summer was the relatively superb performance of Tinka Resources Ltd. (TK:TSX.V; TLD:FSE; TKRFF:OTCPK), which closed 2011 above the July 2011 financing crisis of $0.35. Another favorite that we’ve been involved with for four years and participated in multiple financings for is Explor Resources Inc. (EXS:TSX.V). It reported an NI 43-101-compliant 800,000 oz resource recently. It has been one of our top five companies since 2007. Kaminak is still our darling of the Yukon. There’s a lot of wannabes running around, but Kaminak is superbly run by Rob Carpenter. Our junior penny stock in the Yukon is Stakeholder Gold Corp. (SRC:TSX.V). It is sandwiched between Kaminak and Kinross Gold Corp. (K:TSX.V; KGC:NYSE) in the Ballarat Creek area, which is located on Thistle Mountain. TGR: Tinka’s Colquipucro silver-lead-zinc project in Peru looks promising. What do you know about what’s happening there? MB: I must confess, Tinka has been a nice surprise. It was orphaned after the 2008 meltdown despite having drilled off an NI 43-101-compliant silver resource of 20.3 million ounces (Moz). It has two drills working about 1 kilometer apart at its deposit and at a new discovery, Ayawilca. It’s all open-pittable. Just move the top of the rock off, throw it on a crusher and you’re away to the races. It’s an engineer’s dream. The first game plan is to get that resource up to north of 30 Moz. Now the blue sky becomes what is happening at depth underneath this oxide cap. Just to the south is Cerro de Pasco, which is owned by Peruvian mining company Volcan Compania Minera SAA. It’s the fourth biggest mine in Peru, one of the largest in South America and it is a massive epithermal. What’s interesting about Cerro de Pasco is that the mineral rhodochrosite is prevalent there. Rhodochrosite isn’t prevalent except in an epithermal. Tinka recently indicated that it has rhodochrosite at Ayawilca. There isn’t enough drilling into it yet to confirm it’s an epithermal, but Ayawilca’s blue sky just lights up like a Christmas tree when you look at it. TGR: How does its valuation compare with other companies at similar stages? MB: It’s too early to value Ayawilca, but you can value Tinka’s silver. Tinka’s got 20.3 Moz Inferred, but I have confidence it’s going to move to 30 Moz. With a rising silver price and the investment public warming to juniors again, it could reach a market cap of around $60–75 million (M) up from $38M today. That’s based on the known. The unknown is where you accelerate your return. Ayawilca is the blue sky. If Mother Nature and Lady Luck bless us then we’re going to be looking at the Ayawilca zone adding a lot more upside in the future. TGR: Kaminak just recently optioned some potash properties in Michigan. Do you have any idea why? MB: Shareholder value. Rob Carpenter knows that the ultimate rate of return for Kaminak is going to be the Coffee gold project in the Yukon. Kaminak has other assets that aren’t being paid much attention. The best way to get shareholder value out of those is to let somebody else go to work on them while maintaining focus on a flagship property like Coffee. Let other people bear the risk and costs of exploring those properties. TGR: Kaminak and ATAC shares have started to climb higher this year. ATAC reported a nice intersection in early December of 44 meters at about 4.5 grams/ton gold at its Osiris zone. Is ATAC going to return to its 2011 high? MB: When a stock like ATAC, which moved to $10/share in July, is thrown irreverently under a bus, I have to ask why. I still can’t figure that out. It wasn’t the retail public. It had to be quasi-professional investors. ATAC has an excellent chance to get back to the midrange between where it bottomed around $2/share and its high of $10/share last year. I think Kaminak is a takeover waiting to happen. The way that the Coffee property is being developed, there could be 6–8 Moz there. It has only drilled off 15% of the land package. TGR: Stakeholder Gold is a micro-cap company with a market cap of just a few million dollars. Are they going to be drilling anything soon? MB: Stakeholder had originally planned to drill the Ballarat property in July, but through some unfortunate developments it wasn’t able to. I’ve looked at all the soil and trenching analysis. Various creeks flow down the sides of the mountain into the Yukon River. Where theses creeks flow is where the Klondike Gold Rush was. The source of that mineralization was in the upper elevation where Stakeholder’s Ballarat property is. Stakeholder has excellent soils. It has good trenching results. It has two anomalies there. That property’s got to get drilled. It’s got every bit as much of what I call “geochem evidence” as Kaminak did before it drilled the Coffee property. Yes, Stakeholder is a micro cap. But some Yukon juniors had $35M market caps when they didn’t have any discoveries two years ago. I view Stakeholder as a bottom-feeding expedition now that it has dropped down to $5M. Stakeholder has got an excellent land package. It’s compelling. That’s why we like it. TGR: Some market pundits feel that the junior exploration and mining sector has been hurt over the past decade as it moves from being a retail investor sector to an institutional investor sector. A share price would jump on news and the retail investor would cash out and watch the stock come back down and buy back in. The retail investor would make money two or three times while supporting the stock price. Now the institutional investors get in, make their money and get out and stay out. What are your thoughts on that? MB: If a management group executes its plan, the company gets rewarded whether it has an institutional, retail or a combination shareholder base. Take Kaminak as an example. Despite the recent correction, Kaminak has been a very successful company. People have asked me, “Why aren’t the juniors attracting the same kind of dominance they had in the ’90s and the late ’70s?” There are other reasons than the institutional involvement, such as the advent of exchange traded funds (ETFs). I’m going to get into hot water, but I absolutely detest ETFs. They’re a financial product developed by and for the express benefit of the financial industry as opposed to the investor. I don’t believe in them, I don’t agree with them and I don’t use them. The problem with ETFs is they create this risk on/risk off attitude that the junior mining sector is a basket and it doesn’t matter what Tinka’s got or Explor’s got or Kaminak’s got. That’s what happened in the latter part of 2011. Investors said, “Oh, we better get out! We’ll sell everything.” They didn’t care that Kaminak’s last three drill holes were spectacular. It didn’t matter. They sell their ETF associated with junior mining companies and all the companies that are covered by that ETF get blown off. TGR: Do you have any parting thoughts for us on this sector? MB: In 2009, I predicted higher gold and silver prices and a booming mania-driven junior mining sector. We got the move in the precious metals. We have yet to experience anything close to the mania that we saw in 1978–1980. The TSX Venture Exchange traded to a new low on Oct. 4 relative to the gold price. It was absurd by any measure. Companies are taking the risks to find new deposits. That’s precisely where the big upside is moving forward into 2012. Michael Ballanger currently serves as an investment advisor at Union Securities, Ltd. 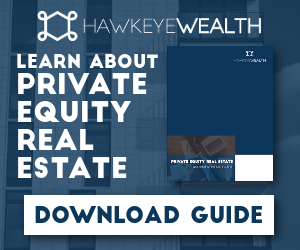 He joined the investment industry in 1977 with McLeod Young Weir Ltd. His substantial background in financing junior resource companies is further informed by his 30 years of experience as a junior mining and exploration specialist. Ballanger earned a Bachelor of Science in finance and a Bachelor of Arts in marketing from Saint Louis University. 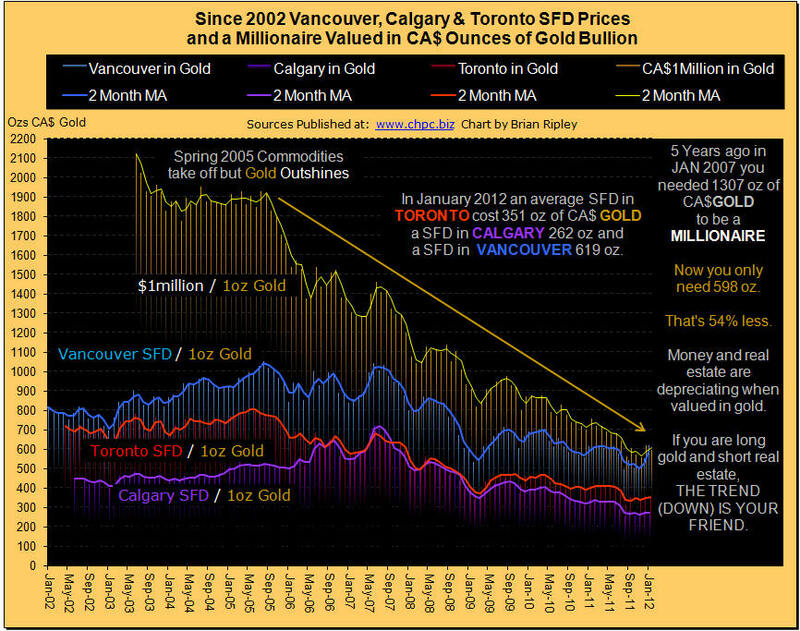 The chart above shows Vancouver, Calgary and Toronto detached housing priced in ounces of gold valued in CA$. Gold mining share prices rise as the “real price” of gold rises eg: the Gold/Commodities Ratio because the commodity cost (fuel, materials, equipment) is falling against the nominal price. See the Homestake Mining Chart from 1924 to 1935. Bullion attracts investment when credit markets contract because of its classic use as a hedge against currency depreciation and its ability to act as money. The millionaire metric allows you to see what your dollar is worth and the (declining) amount of gold you need to be a millionaire. In January 2012 the spot price of gold bounced back up causing the millionaire metric to tick back down towards trend but the sudden January data spike in Vancouver SFD prices has now priced an average house beyond that of a millionaire. Despite the Vancouver outlier, it requires 54% less gold to be a millionaire now than it did 5 years ago. See also the GOLD/CRB ratio here. It’s a chart of gold fabrication demand — including jewelry, coin, dental, electronic and other industrial uses — that I made using data from Morgan Stanley. The red line is supply from gold mines, and the blue line is gold fabrication demand. 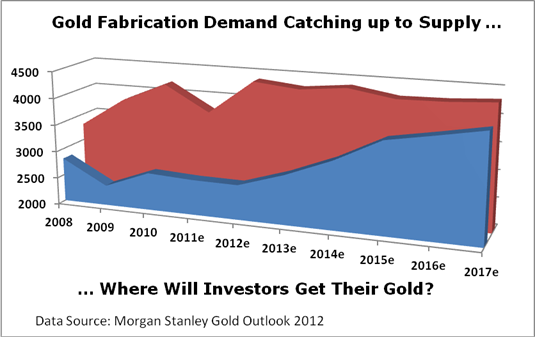 Morgan Stanley’s numbers show that fabrication demand for gold is rising, and estimates indicate that it should soar in the years ahead. The company resolves this by saying that investment demand is going to go down. With all due respect to Morgan Stanley, I believe it has that part of the equation wrong, and the only way this demand squeeze will be resolved is through much, MUCH higher prices that force fabricators to look for substitutes. After all, when the price of an investment — whether it’s gold or stocks or anything else — goes higher, do investors want less of it? Heck no! They usually want more — much more! And this is exactly what I think we’re going to see in gold — a rip-roaring rally that sends gold prices much, much higher. China’s Gold Imports Are Soaring! China’s gold imports from Hong Kong more than tripled in 2011 from the year before, hitting a record 428 metric tons. China does not release official data on gold imports or demand. So the Hong Kong import numbers, published by the Hong Kong Census and Statistics Department, are considered to offer a partial view of overall demand. According to sources quoted in the Financial Times, one trader at a Chinese bank said China’s total imports last year were at least 30% higher than the Hong Kong numbers. And for 2012, analysts believe China’s gold imports are going to continue to ramp up. Bottom line: China is going to overtake India as the world’s largest gold consumer, probably sooner rather than later. And China’s hunger for the yellow metal is going to be a major force driving gold prices going forward. Have We Hit Peak Gold? Ore grades are falling — from around an average grade of 12 grams per ton in 1950 to about 3 grams per ton in the U.S., Canada and Australia. Miners are now going after ore they used to drive over to get to the big deposits. They aren’t chasing low-grade ore because it’s fun. They’re going after low-grade ore because it’s all they can find. Now, there are mines going into production with less than a gram per ton of gold, and they’re quite profitable! Sure, there probably are some high-grade deposits waiting to be discovered. But those higher-grade deposits will be smaller — that’s why they were overlooked the first time around. Fiat currency is paper money — in other words, it gets its value from government say-so. And with the government creating more and more money all the time — the Federal Reserve’s latest weekly money supply report from last Thursday shows that money supply has surged yet again, by more than 35% on an annualized basis — this shakes people’s faith in the value of paper money. So more and more people are turning to REAL money — gold and silver. That’s why U.S. Mint sales of American Eagle silver coins were the second highest EVER in January. Meanwhile, gold-coin sales totaled 127,000 ounces last month, the most since January 2011. But I’m not just talking about individuals. Some state-level legislators are getting so worried about the U.S. dollar, they want out. Lawmakers from 13 states — including Minnesota, Tennessee, Iowa, South Carolina and Georgia — are seeking approval from their state governments to either issue their own alternative currency or explore it as an option. Just three years ago, only three states had similar proposals in place. Of all the state proposals circulating right now, South Carolina, Georgia, Idaho and Indiana have the best chance of passing their proposed bills this year. If those bills become law, it could have a domino effect, cutting away one of the underpinnings of the U.S. dollar’s value. And that would be just the latest problem for the U.S. dollar. The greenback has only held its value so well in the last year because the euro looks so bad that the dollar looks downright good in comparison. When the rug finally gets pulled out from under the dollar’s wobbly feet, the fall could shake the world as we know it. I could give you many more reasons why gold looks so good here. In fact, I’ll be giving a bunch of them in my presentation at the World Money Show in Orlando. But whether you see that presentation or not, know this — the fuse is lit on gold. The forces of supply and demand are lighting the fuse on gold’s next big move. You’ll want to be onboard this metal rocket when it takes off. P.S. Gold is going up, but not straight up. You’ve got to pick the right companies to invest in, AND grab them at the right time so you can get the biggest-possible return. Frankly, that’s why I think the best investment you can make right now is to join my Red-Hot Global Resources service. We just got locked-and-loaded in three potentially rocket-fueled precious-metals trades. There’s still time to get in before these names blast off. Don’t miss out – join today and get access to these new trades! Commodity price risk that is now to the upside and Barclays Capital analysts believe that 2012 is going to be a good one for producers of industrial metals and precious metals, Kevin Norrish, the bank’s managing director of commodities research told the Investing in African Mining Indaba here Monday. The result will be gold trading above $2,000 an ounce, copper trading consistently above $9,000 a tonne by the second half of the year and platinum by the four quarter averaging somewhere around $1,800 an ounce, he said. Also Peter Grandich recommends: AN ABSOLUTE MUST WATCH VIDEO TO THE END!! !